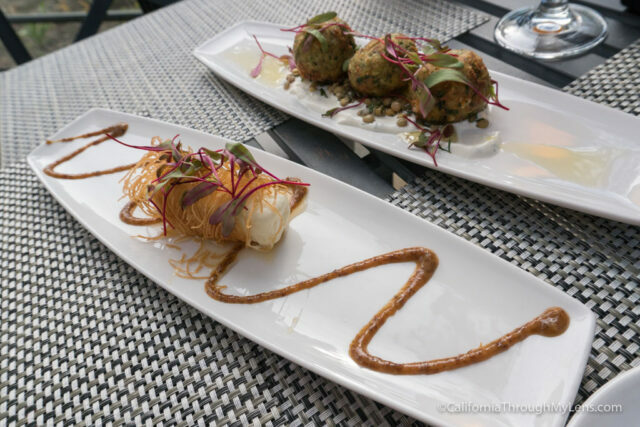 When writing about hotels and their restaurants, I don’t generally split them apart, but Jimmy’s in South Lake Tahoe was so good that I couldn’t help but write a post solely about it. 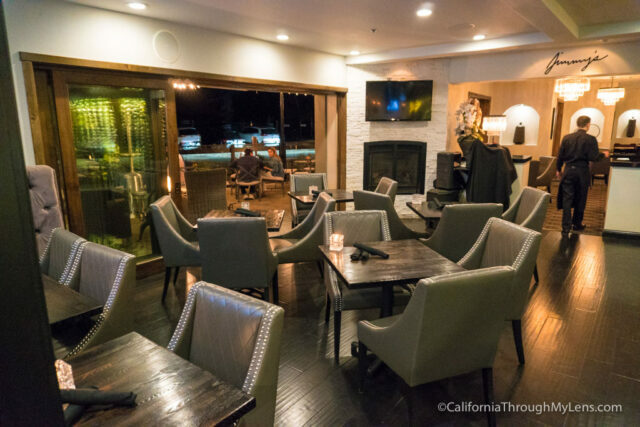 Even if you are not staying at The Landing Resort & Spa, if you are looking for a nice romantic dinner in South Lake Tahoe then give Jimmy’s a try, here is all the information. 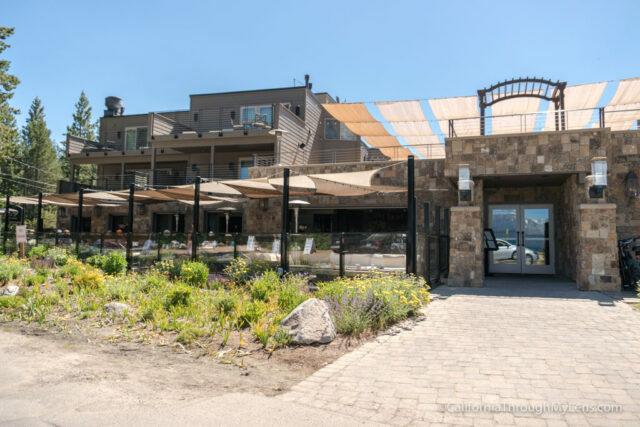 Jimmy’s Restaurant is located inside the Landing Resort and Spa in South Lake Tahoe. There is parking across the street for the restaurant, but it can be busy during the summer as people park there to visit the beach as well. After parking, you will see the large outdoor patio for Jimmy’s and can proceed into the restaurant to be seated. I do recommend that you make a reservation on the weekends as it can be busy. I always opted to sit outside as it was beautiful to overlook the water with the dimly lit market lights providing an excellent mood. 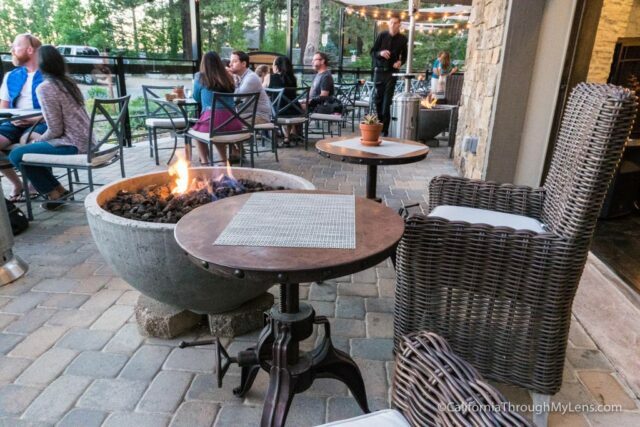 The patio is especially fun for sunset as the sun goes down through the trees and over the lake in front of you. The menu is relatively small, but pretty much everything we had was awesome. Do note this place is pricey, which is why I recommend it for a nice romantic dinner. It was easily worth it though, and we ate two dinners and a breakfast here. Below is what we ordered, but the huge standouts are the feta and the lamb, everything else is below those two as they are both mind blowing and I highly recommend them. 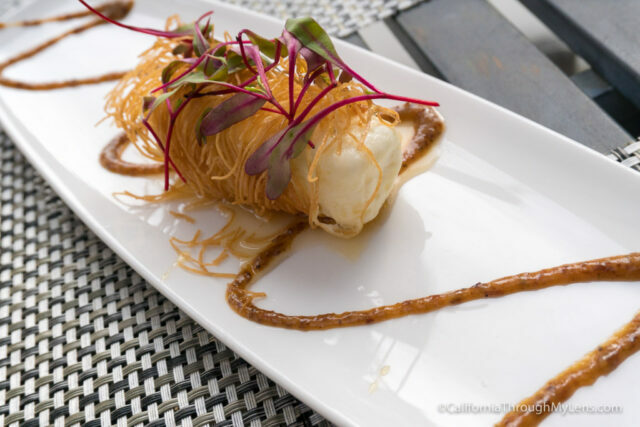 Kataifi Wrapped Feta – Fresh, mild, and delicious feta imported from Greece that is subtle but slightly tangy. Served with crunchy filo dough like you would find on baklava and topped honey and a raisin oregano dressing. This dish is so incredible with a perfect combination of a sweet and savory taste. The cheese is rich and creamy, but the honey mellows it out and completes the flavor profile. 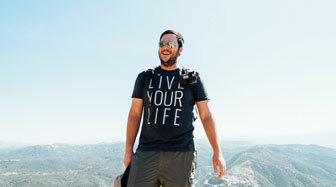 It made me realize that I have never had high-quality feta before as it is often a throwaway cheese for me. I can’t overstate how good this dish is, my wife and I went back and ordered it again the second night. The only other time that has happened on a trip was at Brenda’s in San Francisco which is one of my favorite places in California. 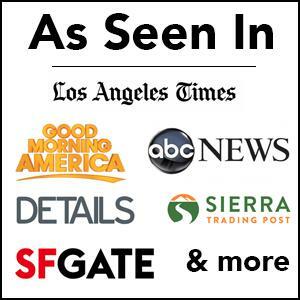 Be sure to order it; you won’t be let down. 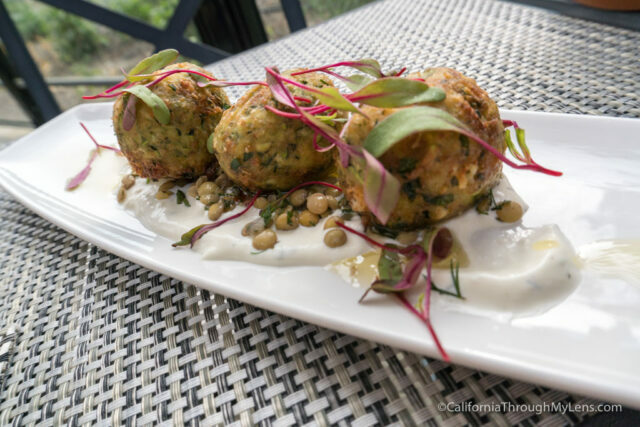 Zucchini Keftedes – Flash fried zucchini cake sitting on tabbouleh and homemade ranch. It’s a nice fresh take on pub style Greek dish which gives you that lightly battered zucchini taste in a subtle way. 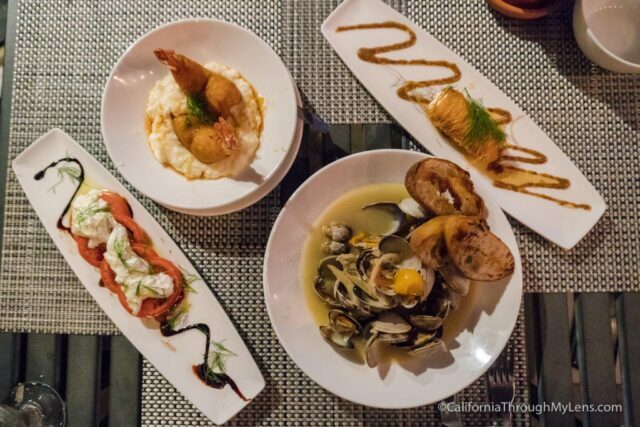 The ranch is a great compliment as it does not overpower the dish like you often expect it too. It’s great but if you can only choose one, choose the feta. Tiger shrimp – Crazy to think that you can order a dish and have only two shrimp but these shrimp are massive and are more like lobster than shrimp. I can only describe them as perfectly succulent. 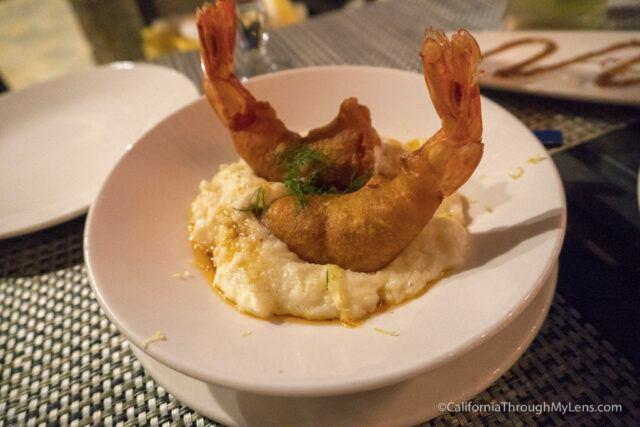 The shrimp is fantastic, and it has a rich flavor from the light batter and the grits it’s served on. 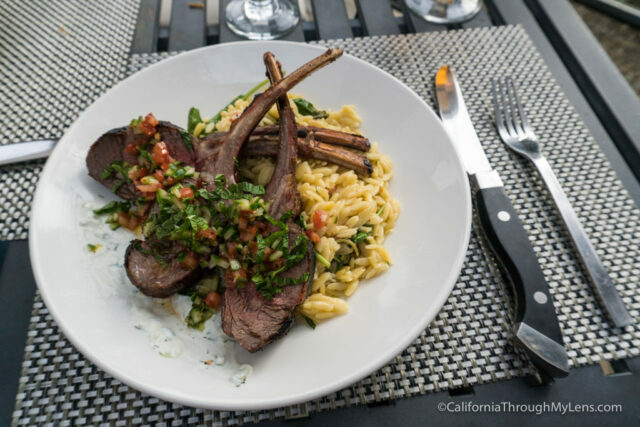 Rack of Lamb – Don’t worry about anything else for an entree just order the lamb. I don’t usually order lamb as it is not one of my favorite meats but it was recommended, and I am so glad I did. It was easily one of the best dishes I have had in the last few months. The meat is cooked perfectly and melts in your mouth. Even the rub of spices they use on the crust of the meat is perfectly set up to compliment the dish. The tzatziki, which is a Greek yogurt sauce, is served below the meat and it is a nice way to calm the heavy flavor down. Even the orzo isn’t a throwaway side and it has an excellent olive oil, Greek spice and citrus flavor. 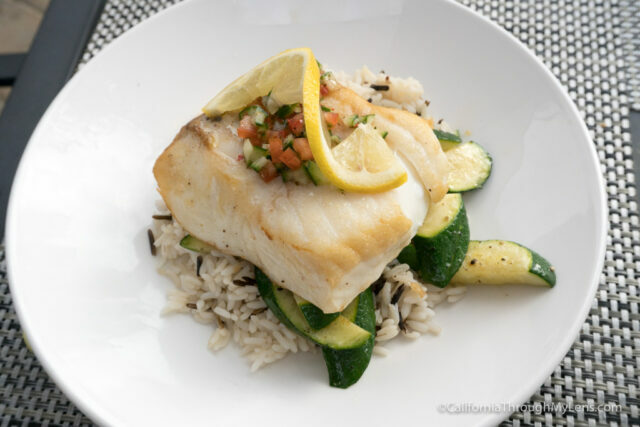 Fish of the day – This is what my wife got, and when we went it was a halibut served on top of a citrus rice with zucchini. The fish is light and summery. It is cooked well, and flakes apart on your fork then melts in your mouth. It has a nice lemon zest to finish off the flavor. 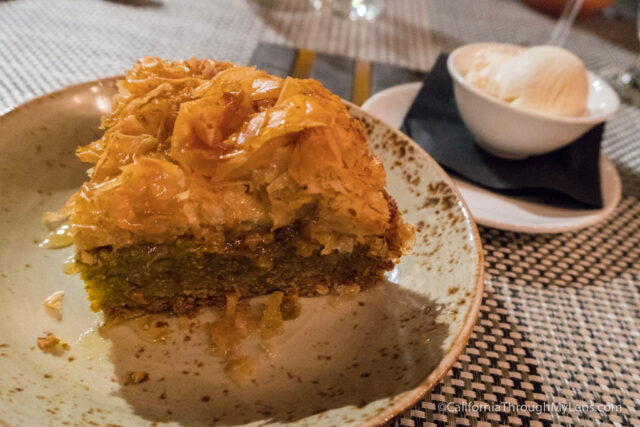 Baklava – Not a traditional baklava, it is almost more of a pie. The flakey top goes well with the nice gooey filling. I recommend getting it with a scoop of ice cream to take it to the next level. We also came for breakfast one morning when we were at the hotel and here is what we ordered. 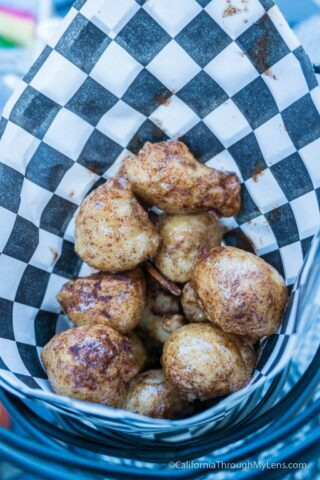 Loukoumades – Small dough balls covered in cinnamon, honey and an orange glaze. Nice sweet addition to the breakfast that everyone can share but not one of my favorite dishes. Jimmy’s Smashed Avocado Toast – They don’t hold back on the avocado which I appreciated. Topped with thick slices of fresh tomato, roasted chili feta, and eggs any style. I recommend over easy as the yolk adds a good flavor to the dish. It’s a filling breakfast that’s well done for a simple classic. 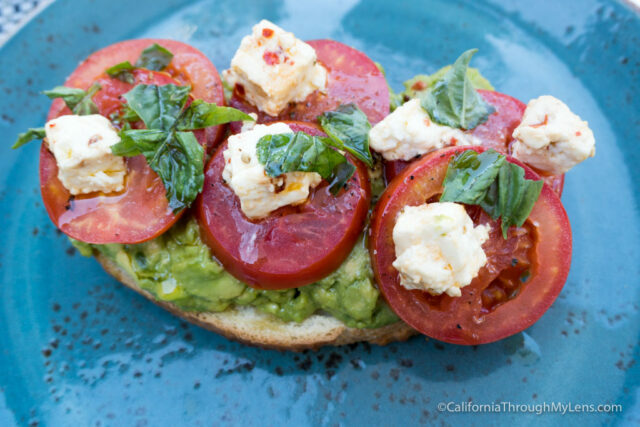 The bread is easy to chew which is nice as that is not always the case with avocado toast. Chilaquiles – A tasty and spicy red enchilada sauce that marinades with the chips so that they are soft but still have a little crunch. The feta and cilantro add a fresh taste to the dish and the eggs on top finish it off. It’s a simple dish with a lot of flavors and just the right amount of burn. 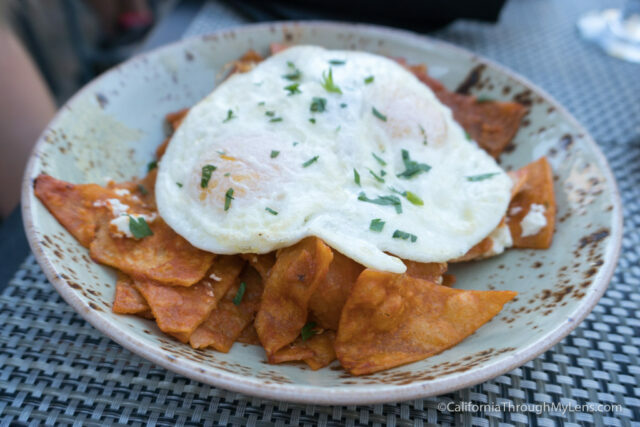 If you like chilaquiles, you will like them here. 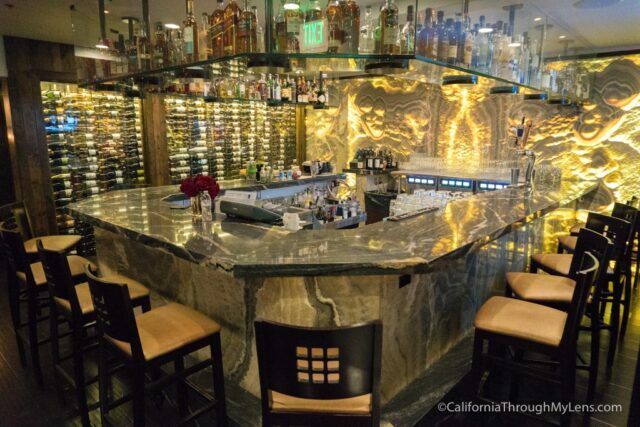 Jimmy’s Restaurant in South Lake Tahoe is a fantastic place for a nice relaxing meal in the city. If you are looking for something with excellent food and a relaxed atmosphere, then look no further. Let me know what you think if you have been in the comments. Disclosure: A few of these meals were provided free of charge, all opinions are my own though.